Big opening event for the Bucket Shop | The Bucket Shop Inc. 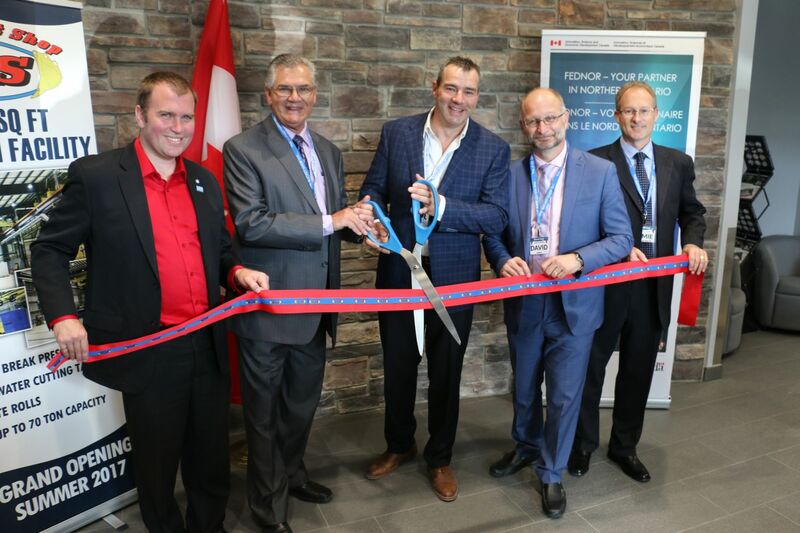 The newest heavy industry in Timmins had a formal opening in the city’s west end last Wednesday when The Bucket Shop threw open the shop doors for politicians, community leaders and other dignitaries to tour to massive new blue building on McBride Street. The Bucket Shop is a Timmins-based specialty plant for the creation and manufacture of the custom heavy equipment buckets for front-end loaders, scoop trams, excavators and even dozer blades for mining and construction industries. Company president Ross Woodward revealed that the new facility covering 65,000 square feet and costing $15-million, was a project that was in the works for six years, no less. He added this is the fourth time since 1990 that the company has grown. He said this latest expansion actually took three tries to get it up and running. He said the first plans were considered back in 2011, but as the economy wasn’t growing as well as they hoped, Woodward said they “got cold feet” and put the plans aside. “We got going again in 2013. We expanded on the original plans. We upgraded them,” he said. “We got cold feet again because of the economy,” he said. Two years after that it was 2015 and the decision was made to push forward, he said. Woodward said the success of the latest venture is the result of cooperation and assistance from numerous groups and organizations, from city hall, to College Boreal, to the Fed- Nor development agency, the Timmins Economic Development Corporation, NEOnet, the chamber of commerce and others. He said the company now has roughly 150 employees and business is brisk. “We’re currently assembling 27 mining trucks for Caterpillar, about 50 miles east of Montreal,” said Woodward. “They’re headed to Baffin Island.” He said the company also has quite the respectable list of customers as he rhymed off the names of several Northern mining companies and heavy industry firms. Woodward also revealed that the Bucket Shop is a manufacturing company that ships around the world. “We currently are shipping to Mexico, the U.S., Yukon, Alaska, South America and Africa,” he mentioned. That global marketing effort impressed Timmins Mayor Steve Black who took part in the opening event. “Talk about a confidence booster for the community. To see a local business invest and expand their business and be able to serve the world market, it is truly great news for all of us to watch the development take place,” said the mayor. “On behalf of mayor and council I want to say thank you for your continued investment in the community. You’ve been great community partners on the social side of things and great community partner on economic investment and jobs in our community,” he said. Company vice president Paul Woodward remarked that the company’s strength was the people who worked there and were committed to success. “It has been a long journey. It has been most interesting. We have been fortunate to have been surrounded by some of the best people I think that we could possibly surround ourselves with, and helping make this possible,” he said. Woodward said he was proud of the company, which has been a strong family firm and now comprises three generations, with his father, himself and his son. He added that although the expansion took time, it was something he believed had to be done. “It was imperative that we made this kind of a move and the mines can now invest in the North with confidence knowing that services are available to them in the North to maintain and keep that equipment going,” he said. Woodward also revealed that not all his people and equipment are moved into the new building yet. He said The Bucket Shop is so booked up with orders that they can’t slow down enough to carry out the move. He said it would be several weeks before that happens.